It goes without saying that the clock ticks on and that seems never more true than during the holidays, around December, when time is precious and it really flies. That said, I've been making an effort to be organized and realistic in my December plans. I think I'm doing well this year - I don't feel rushed and I'm savoring the season, which means simple things like family gatherings, an outing or two to see the lights and sights of the city, and time to enjoy all the wonderful seasonal treats. I love seeing, buying, and enjoying all the festive holiday goodies at this time of year! I can hardly resist a colorful box or any kind of foil-wrapped chocolates. I make sure we indulge in plenty of that along with some homemade treats. Holiday baking is a real pleasure and I love days when the kitchen turns into a mini cookie factory and I churn out a batch or two of Christmas cookies. Come this time of year, I think of all kinds of cookies but particularly, I think of shortbread and icebox type cookies - the sandy, crumbly cookies that I frankly don't make too often otherwise. They always seem to hit the spot - a great accompaniment to a cup of hot chocolate or coffee. The slice-and-bake kind of cookies are also convenient, great for impromptu enjoyment or for gift-giving. 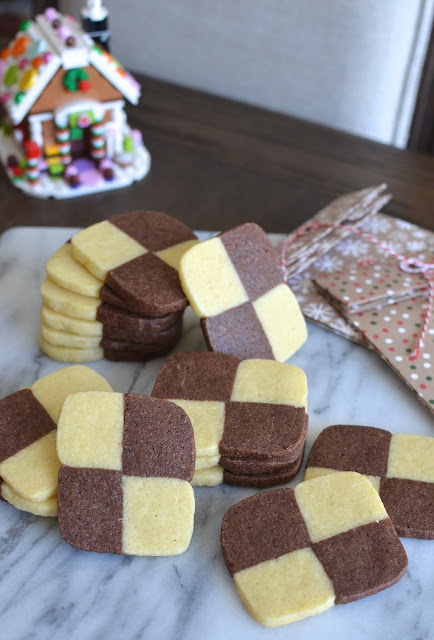 For fun, I recently tried a batch of checkerboard icebox cookies. 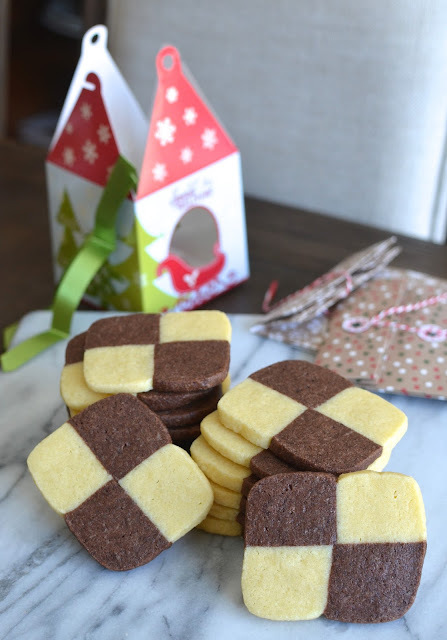 Not only is the pattern fun (like that Battenberg cake I made a while back) but you also get to combine two classic flavors - vanilla and chocolate - in one cookie. Best of both worlds! I was afraid the cookie might be tricky to pull off but the recipe comes from The Perfect Cookie book by America's Test Kitchen, which gave me the convenience to tackle it. It really was easy to do and the cookies came together like a charm. I'm happy with how my first attempt turned out and the pattern of the cookie is not only fun to see but tasty to eat. I think we were partial to the chocolate part of these checkerboard cookies but that probably doesn't surprise anyone who knows me. 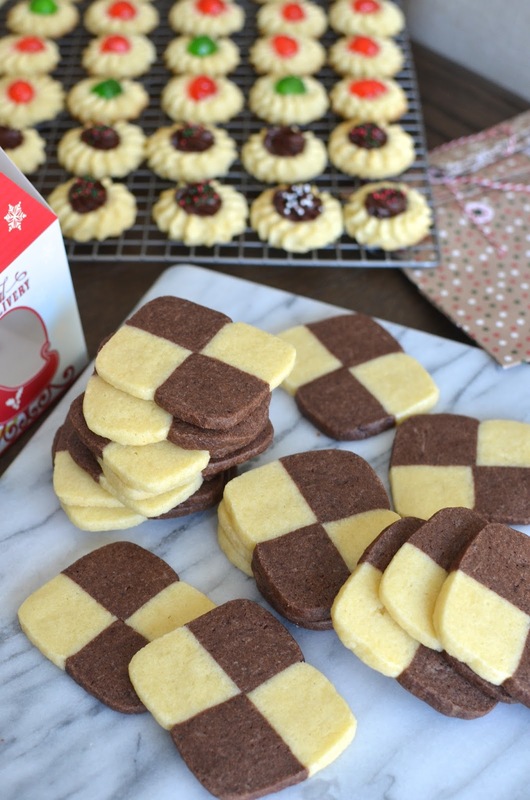 To make these checkerboard cookies, you start with one simple icebox cookie dough. Divide the dough in half and flavor half with chocolate by adding some melted chocolate and cocoa powder. Then, shape each portion of dough into a rectangle log, about 2 inches wide by 9 inches long. Stack the logs on top of each other and chill it until firm, at least 2 hours. This is a great make-ahead since you can also leave it in the fridge for up to 3 days. To get the checkerboard pattern, slice the chilled log in half lengthwise and then rotate one of them. Gently press the logs together and it will naturally adhere. You can then slice the cookies into about 1/4 inch thick slices for baking. They will puff and expand just slightly so you can fit them pretty snugly on a baking sheet. Just 12-15 minutes in the oven and they are ready to go! I am so grateful when a recipe just works...and this one works. These icebox cookies were fun to make and they're a nice little treat for the holidays. On the same day I baked some of these checkerboard cookies, my little cookie factory also churned out a batch of cherry almond star cookies, which my son adores. We saved some for ourselves and packed some up for friends. Food is always better when shared. Hope you are having fun making and enjoying your fair share of treats this season! Place butter, granulated sugar, confectioners' sugar, and salt into the bowl of a stand mixer fitted with the paddle attachment. Beat on medium-high speed until light and fluffy, about 3 minutes. Add egg yolks and vanilla, and beat until combined. On low-speed, add the flour and mix until just incorporated. Remove half the dough from the mixing bowl and set aside. To the remaining half in the mixer, add the melted chocolate and cocoa powder. Mix on low speed until fully combined. Set the two dough onto the counter and shape each into a 9x2 inch rectangle, about 1 inch thick. Stack the dough to make a 2-inch square log. Wrap the log tightly in plastic wrap and chill in the refrigerator, at least 2 hours and up to 3 days. When ready to bake, place oven racks in the upper and lower-middle positions and preheat the oven to 325 degrees. Line 2 baking sheets with parchment paper. Slice chilled log in half lengthwise, rotating one half to create a checkerboard pattern. Press gently to re-adhere the halves. Slice dough into 1/4-inch thick squares and place them onto the baking sheets, spaced about 3/4 inches apart. Bake until edges are light golden, about 12-15 minutes, rotating the pans midway through baking. Remove from the oven, let cookies cool on the baking sheets for about 5 minutes before removing them to a wire rack to cool completely. They are so beautiful! Haven't baked checkerboard cookies in ages..wish I could taste a few of yours, Monica. You absolutely nailed these cookies Monica! They are gorgeous and perfect in every way. I have that same cookbook and have wanted to try these cookies for years. You make it look so easy and I bet they are terrific for gifting. Bravo! Thanks for the encouragement, Tricia. How can anyone resist a cookbook with that title, right...and from such a trustworthy source. These came together just like they said it would (all imperfections are just my fault). Hope you are enjoying the season! I've been doing a better job this year too - not over-scheduling, etc. So much more pleasant and fun! Anyway! These cookies are too cool! The pattern just makes them feel so special! Thank you, Ashley. Enjoy the rest of December! Monica, these cookies are beautiful! I can't wait to try this. Now I am excited about looking into the Perfect Cookie cookbook, too. Do the recipes in that book tell how long the cookies/bars stay fresh? Though butter cookies and shortbread are always a good bet for care packages. I bet your gifted cookies were a hit!